NYSE and Nasdaq breadth continues to expand and back up the current rally. 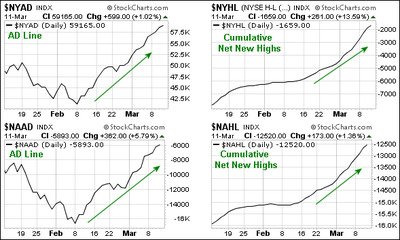 From the breadth charts page at Stockcharts.com, we can see the NYSE AD Line ($NYAD) and Nasdaq AD Line ($NAAD) moving sharply higher the last five weeks. 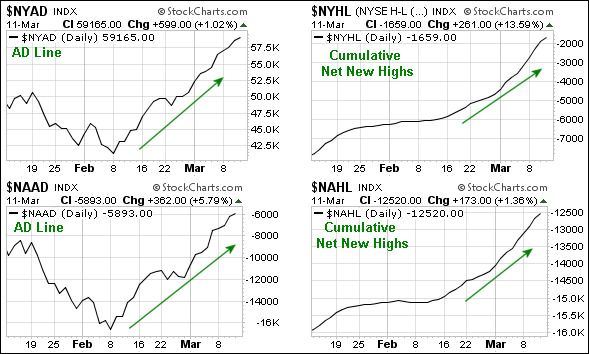 Also notice that the cumulative Net New Highs lines are also moving higher.